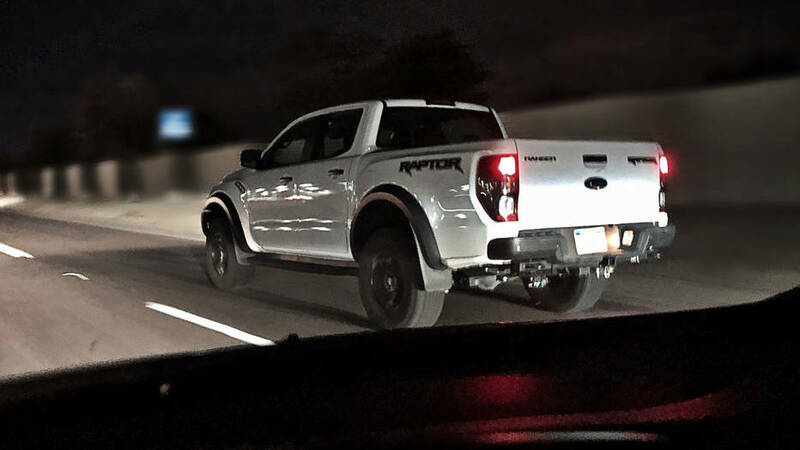 A sharp Imgur user spotted the Ford Ranger Raptor cruising down the night highway this week — just a few days before the Detroit auto show. We’re not saying it will be on the floor — in fact, Ford says it won’t be, or at least, “it won’t comment on future product.” But what a coup it would be. It would also look nice beside to the next Mustang GT500, which is confirmed for the show. Here’s what we know about the baby Raptor, or at least its overseas counterpart: It’s powered by a 2.0-liter turbodiesel making 210 hp and 369 lb-ft of torque with a 10-speed automatic. It has a solid axle, coilovers and a Watts link in the rear, reportedly “built to withstand high-impact off-road events.” It also gets Fox Racing Shox and underbody protection plates. Much of that stuff could carry over, though some things would have to be redesigned for our crash laws. Engines could easily include Ford’s 2.3-liter Ecoboost four and possibly its 2.7-liter Ecoboost six. Either way, we’re in “wait and see” mode now. Hopefully we’ll have a better idea next week at the Detroit show.